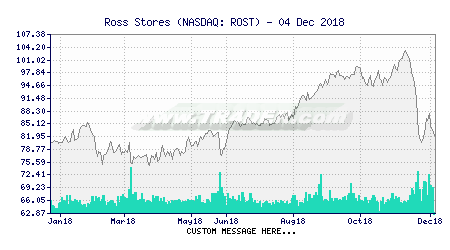 TR4DER - Put a Ross Stores [ROST] chart on your website! Last Minute: "The Mueller report vindicates Jeff Sessions - Washington Examiner" Fri, 19 Apr 2019 17:14:00 GMT "The Russian collusion story is a reminder of why media should 'wait and see' - Washington Examiner" Fri, 19 Apr 2019 23:24:00 GMT "Justice Department dismisses Democratic Mueller report subpoena as 'premature and unnecessary' - Washington Examiner" Fri, 19 Apr 2019 21:46:00 GMT "'No authority': New Mexico governor tells militia to stop arresting migrants at border - NBC News" Fri, 19 Apr 2019 19:21:00 GMT "Sanders goes on offensive defending credibility after report - Salt Lake Tribune" Fri, 19 Apr 2019 21:22:20 GMT "Turpins Sentenced to Life In Prison For Starving, Shackling Children - NPR" Fri, 19 Apr 2019 22:55:00 GMT "Florida deputy reassigned after video shows him punching teen in the head - NBC News" Fri, 19 Apr 2019 20:40:00 GMT "Hurricane Center reclassifies Michael to Category 5, the first such storm to make landfall since 1992 - The Washington Post" Fri, 19 Apr 2019 16:14:47 GMT "Armed Mexican troops question American soldiers on US side of border - CNN" Sat, 20 Apr 2019 00:56:00 GMT "Cummings on impeachment: 'We may very well come to that' | TheHill - The Hill" Fri, 19 Apr 2019 18:46:32 GMT For more news, click here. If you have a website where you wish to put a chart about an asset or an index, or even a personal blog about investments, or simply need to have charts to use on simple messages on forums, you can get them here, for free. It's true! TR4DER portal already allows you to use our charts on your web pages, blogs, personal works, etc. TR4DER portal now allows you to use our charts on any website. If a certain asset changes its symbol in the future (usually we keep those symbols the more similar possible to the ones used on the Internet and we change them also for search purposes), the webmasters of certain websites won't have to preoccupy with changing the symbol in the code on their websites, since the TR4DER portal will do all the work by recognizing the symbol of the ancient assets which are not used anymore, and show the correct ones. For example, we have the old symbol of "SNA.LS", which can be used without any problems by any user in the code that is put on their websites, and TR4DER will manage to search the "Sonae SGPS" asset anyway without its new symbol. For that reason, it will never be necessary to change anything on the HTML code on the websites even if we change the assets' symbols, since everything is done by the TR4DER portal itself. These charts are 100% free and without any cost, neither there is any obligation with their use, just the request that the images aren't altered. This way our users have access to our updated charts, freely available for everything they might need, even on your websites, making reference to your websites on the charts we provide, as if they were your own charts made by yourself, but in an automated way. You can even use these charts on your personal works or printings for your work, ebooks, or other reasons, exactly as they are. You can even adjust the HTML source code provided by us to adjust the chart so that it can fit better on your website, and you can also change the size of the image on your website itself if necessary, but to have better quality it is recommended that you do it directly on our portal. If you choose to use a custom text, the message on the bottom part of the chart will be substituted by the text you choose to have as a custom message, which could be used to mention your website, as for example "Look my technical analysis in my personal blog www.tr4der.com". The charts can be from any of the assets that we have on our website, they can have a size customized by the user, a custom text, and even a time-frame, which could be of days, months, years, etc. 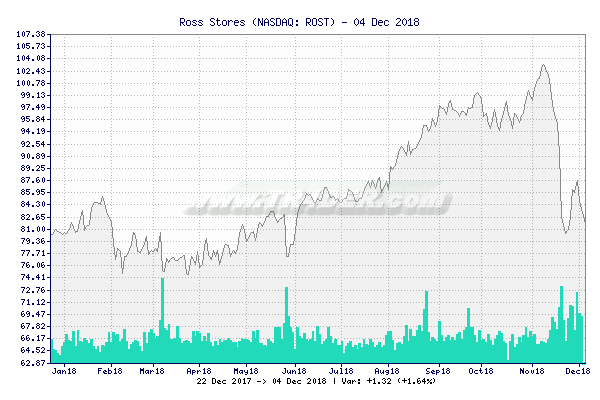 The asset is already chosen, in this case the "Ross Stores [ROST]", asset, if you wish to select choose another one, you should go back to the quote page, and select another asset. You should select only the width and height of the image you wish and click on "Obtain Code" to see a preview of the chart how it is at the moment with the data you have chosen. After doing that, you can put a custom text at your taste, and click again on "Obtain Code" and you'll have the final code of the chart you've made for you to put on your website. distance between the chart and the following text.